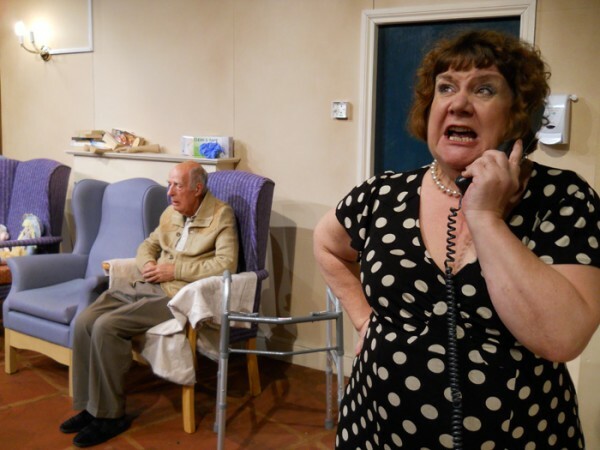 Carol Bunyan’s dark comedy of conflict is set in a retirement home; such a setting provides the perfect environment for Bunyan’s merciless humour while forcing the audience to engage head-on with the central theme of mortality. Nick (Alan Charlesworth) is a dedicated but overly enthusiastic nurse at the Restmore Nursing home. His life revolves around envisaging ever more ridiculous games to entertain his weary and bemused patients. His booming opening soliloquy addresses the audience as if they too were patients, immediately immersing the audience into the home’s bleak atmosphere – which is wonderfully evoked by David Harris’ queasily recognisable stage design. The part of Nick was written specifically for Charlesworth and it shows. His amazingly malleable face and bulging eyes are amusing in and of themselves, but beneath this there is a sense of something darker underlying his endless, idiotic games. Through a series of recollections, sparked by random word associations, the audience learn of his terrible guilt over the death of a young boy while he worked as a nurse in a casualty ward. As a result Nick has spent eight years attempting to gain access to ‘his file’, terrified of the potential accusations it might contain. Driving the plot forward is the conflict between the home’s employees and a pair of teenage students arriving on work experience. Matt (Aaron Mwale) and Suzy (Rebecca Farrell) initially view their time there as a chore, but they come to bond with the residents, particularly with Ken (endearingly played by Derek Wright) whose deafness ‘is like being on a different planet.’ While the duo never quite recover from the trauma of serving ‘custard’ to the residents, unlikely parallels emerge between them and bridges form across the generation gap, revealing the characters’ shared fears and desires. The cruelty of institutionalism is a running theme, and the school environment is paralleled with that of the retirement home, with Nick recalling his unhappy treatment at the hands of school bullies. Bunyan gradually opens up each character in turn, exposing their anxieties.